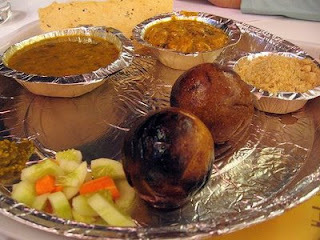 Dal Baati Churma is quintessential Rajasthan. A delicious, rich, flavorful dish, a whole meal in itself. It is basically composed of three things, as the name indicates - dal, baati and churma. The Dal is actually a mix of 5 pulses - tur dal, chana dal, green moong dal, yellow moong dal and masoor dal. Some people also add a little tomato puree. Spices and ghee add the necessary flavor. Baati is essentially a wheat dumpling. Made out of whole wheat and cooked in a tandoor oven. The more indulgent cooks fry the baatis in ghee. But the purists believe a baati can only be made in a wood fire oven! Fry it or bake it, there's no escaping the ghee in which you soak it. Before eating, the baatis are usually soaked in a bowl of ghee! Churma is a mixture of fried wheat and a sweetener (jaggery or sugar) garnished with almonds. Jaggery adds its own flavor while sugar does its job in a rather unobtrusive way. 'Gatte ki subzi' is a good concomitant. It is basically fried gram flour ('besan') dumplings in a gravy. Some people also add a salad of cabbage, tomato and cucumber. While some also have 'Panchvati sabzi' which is a mixture of green tomatoes, capsicum, ridge gourd, peas and cucumber, cooked and flavored. Green pudina chutney also adds to the taste. So, you see, how rich and complete the dish can be. This is a dish that many people acquire a taste to. Many people do not like it the first time they have it. But have them eat it 2-3 times and then they are hooked for life! I recall a funny incident revolving around the dal baati. This dish is not very commonly eaten outside Rajasthan. So, many people do not know about it. As it happened, my cousin brother was getting married to a girl from Mandvi, Gujarat. A group of about 50 people were coming to Hyderabad for the wedding. Dal Baati Churma was the on the menu for the first meal they were to have in Hyderabad after a grueling 36 hour journey to Hyderabad. The tables were laid. The guests took their seats in anticipation of a sumptuous meal. The waiters started serving the baatis, the dal, the churma and the other accompaniments. None of the guests knew about this dish. So, assuming the baati to be a kachori, started eating the baati plain and were a little surprised at the bland taste! Some others were waiting for puris or rotis to be served. The embarrassed hosts had to explain to them that there were no puris or rotis and the dal baati had to be eaten just like that! I haven't been to Rajasthan more than a couple of times and both times have been before I discovered dal baati. I'm sure the best dal baati churma is available somewhere in that state. Among places that I have been to, 'Dhola ri Dhaani' in Hyderabad makes really good Dal Baati Churma on Sundays. Wow Kamal what a beautiful Recipe. When are you treating? How about 25th of December? I hope you're coming. Thanks for your comment, Manoj!